Do you have a strange odor coming from your room? Are there small brown scales in your bed? Would you know the signs if you had bed bugs? One of the most common signs that people notice when they have bed bugs are the bites. Before marks appear on their body, people generally don’t even consider bed bugs. The bites that will appear if you have bed bugs are red, flat welts that will be in zigzag lines, straight lines, or a small cluster. You won’t get a disease from the bugs, but they are itchy and can lead to infection if irritated by scratching until blood appears. The bites can be on arms, shoulders, or any skin that’s left naked while sleeping. This differs from other bugs during warm weather that might bite around the ankles, like fleas, chiggers, and mosquitos. An infected bed is the second telltale sign that something has infiltrated your sheets. After biting you, there will be (usually dried) blood stains that are small, in the edges and corners of the bed. As they mature, bed bugs shed their skin, so the second sign would be finding their circular tan exoskeletons in the covers. The last symptom, that you won’t notice as quickly as the other ones is the smell. A pungent musty smell, like clothing or towels that have been wet too long, will begin to linger in the air. Due to the pheromones the bugs release, the air turns as arid as an unkempt locker room. If you are experiencing one or more of these signs, then there’s probably a bed bug infestation. We recommend bed bug removal as soon as possible. 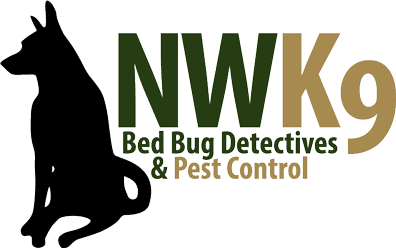 Northwest K9 is the best bed bug exterminator in Seattle, WA. Try our unique way of bed bug removal by having our reliable dog, Magic, find the bed bugs and exterminate them. Call us, (206) 801-3522 today!